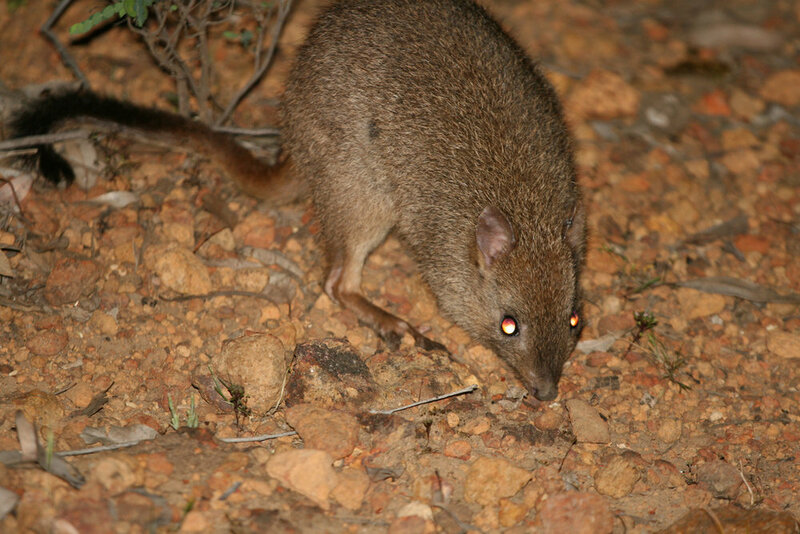 The Brush-tailed bettong or Woylie (Bettongia penicillata) was until recently very abundant in the south west but, starting in 2006, it has suffered a dramatic decline and is now currently listed as Critically Endangered. Nobody knows why. This underlines the critical need for protection of these unique species and their habitat in a biodiversity hotspot under increasing pressure from urbanisation. This species is strictly nocturnal and is not gregarious. It can breed all year round if the conditions are favorable. The female can breed at six months of age and give birth every 3.5 months. Its lifespan in the wild is about four to six years. The woylie is able to use its tail, curled around in a prehensile manner, to carry bundles of nesting material. It builds its dome-shaped nest in a shallow scrape under a bush. The nest, which consists of grass and shredded bark, sticks, leaves, and other available material, is well-made and hidden. The woylie rests in its nest during the day and emerges at night to feed. The woylie has an unusual diet for a mammal. Although it may eat bulbs, tubers, seeds, insects, and resin of the hakea plant, the bulk of its nutrients are derived from underground fungi which it digs out with its strong foreclaws. These fungi can only be digested indirectly. In a portion of its stomach, the fungi are consumed by bacteria. These bacteria produce the nutrients that are digested in the rest of the stomach and small intestine. When it was widespread and abundant, the woylie likely played an important role in the dispersal of fungal spores within desert ecosystems. The woylie once inhabited more than 60% of the Australian mainland, but now occurs on less than 1%. It formerly ranged over all of the southwest of Eastern Australia, most of South Australia, the northwest corner of Victoria, and across the central portion of New South Wales. It was abundant in the mid-19th century. By the 1920s, it was extinct over much of its range. As of 1992, it was reported only from four small areas in Western Australia. In South Australia, a several populations have been established through reintroduction of captive-bred animals. As of 1996, it occurred in six sites in Western Australia, including Karakamia Sanctuary run by the Australian Wildlife Conservancy, and on three islands and two mainland sites in South Australia, following the reintroduction program and the controlling of foxes. Today, this species lives mostly in open sclerophyll forest and Malee eucalyptus woodlands with a dense low understory of tussock grasses.However, this versatile species is also known to have once inhabited a wide range of habitats, including low arid scrub or desert spinifex grasslands. "It is believed the woylie population peaked a decade ago at more than 250,000, but numbers have since declined by about 90 per cent." However, despite these losses woylies continue to thrive as small localized populations in fox- and cat-free sanctuaries, including a population at Wadderin Sanctuary in the central Western Australian wheatbelt established in 2010. Wadderin is one of very few sanctuary projects within Australia managed by a local community. The community group includes current and retired farmers and townsfolk. This project was set up to exclude foxes and feral cats and so allow reconstruction of the past native fauna.